10. "Do you have onions?" - Technically not a stupid question, but what self respecting hot dog joint wouldn't have onions? 9. "Busy today?" - Particularly irritating when asked during a torrential rain storm without any other customers in sight. 8. "Is the (insert menu item here) any good?" - It's ALL good! 7. "Can you tell me how to get to (insert direction question here)?" - No. What am I, MapQuest? You want some hot dogs? 6. "Do you have change for a hundred?" -For a Coke?!?!?!?! 5. "Do you have heat in there?" -Yeah, but it doesn't do much good with the window open, so whaddayah want? 4. "How long have you been here?" What, today? 3. "Do you have ribs?" Yeah, someone actually asked this once-Are you friggin kidding? This is by far the best blog i've seen in a long time. 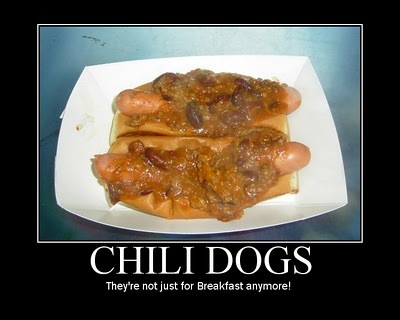 I love hot dogs, I wish this were near me...I need one bad. I like this blog too! Refreshing in a meaty sort of way. Webcam in the offing? Good PPP work too ! I was reading that post about how you decided you wanted to be a hot dog man and I'm sitting here nodding my head.